Time for MTM again, and the theme this week is birds and nests. 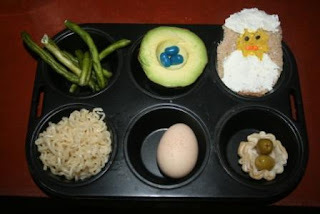 What we have here are some green bean twigs (for nest building), blue jelly bean 'eggs' in an avocado 'nest', a chick breadwich, some ramen nesty noodles, a boiled egg, and 2 olives in a tart. I adore your chick breadwich and envy you because of the beautiful bird. I love the little chick sandwich. Too cute! I love the chick too. The avocado nest is genius. Awesome tin!!! Everything turned out great! Holy Cannoli! Your tin is so stinken cute! I may need to step up my game next week. seriously cute ideas. i would have never thought of using an avocado for a nest! Oh, I think I just signed in with that last comment from "Jen" using the wrong account. Anyway, that was me. Great tin - I love the avocado and the tart shell nests. now you know... YOU KNOW i was concerned about elvis when i saw today's theme. whew. thank you for letting me know. elvis could totally take on foghorn. 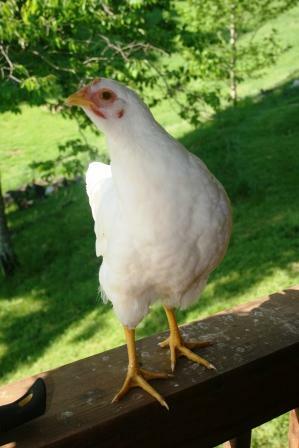 or leghorn. who has time for friendly when you're stylin'?